KEEP COOL: Observing quiet hours on camping grounds means turning off your generator — even on the warmest nights. Merlin provides accurate battery knowledge for informed, fuel-efficient generator management. 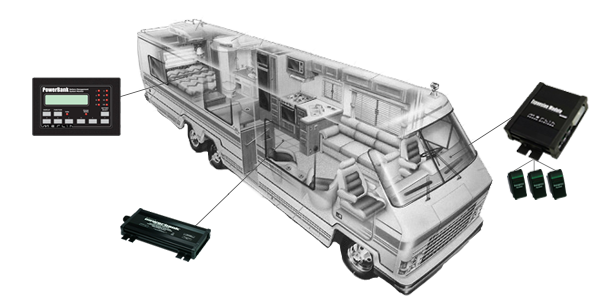 Operate air conditioning with the engine off and have confidence your RV will start in the morning. KEEP THE KIDS ENTERTAINED: Change “Are we there yet?” to “Are we there already?”. Merlin ensures consistent power for MP3 players, televisions, DVD players, laptops, and smartphones. SAVE ON FUEL: Know when generators should be turned on and when they can remain off. Efficient split charging of batteries directs power where it is needed most and minimizes generator run-time. GET A GOOD START:Leaving a light on in the bathroom can mean a dead starter battery. Prevent dead batteries with dead-battery protection that also maintains battery health for longer life and more consistent performance. DEAD-BATTERY PROTECTION: When discharged past half of their capacity, batteries will continue to provide power but at the expense of future battery performance. Internal damage to the battery begins at this point, all invisible to the user. Dead-battery protection prevents this damage, maintains consistent battery performance, and extends battery life. INTELLIGENT SPLIT CHARGING: Efficiently direct power from any charging source — alternator, generator, or shore power — into all of your battery banks; automatically routes power to battery banks (or loads) that need it most. ALWAYS-ACCURATE BATTERY MONITORING:Make intelligent decisions concerning battery charging with accurate State of Charge information. Overcharging and excessively discharging batteries degrade their performance and shortens their lifetimes. Merlin’s battery monitors are unique because they become more accurate over time so they never need manual resetting (also known as synchronization).